I am on my second week with my first ever sourdough starter. I have made pancakes and waffles that turned out amazing! I am celiac, so I am starting with the white rice starter and hoping to try a brown rice and a gf oat flour starter once my white rice has moved to the fridge. I have a couple of questions. I have two very curious cats who eat everything, so I am keeping my mother in the cupboard normally, and occasionally in the bedroom when I bake with yeast. The mother is very bubbly and smells very nice and sour. For some reason I am getting yellowish staining on my flour sack cloths covering the mother. I switch them out about 3-4 time per week, but they will get discoloring in a day or two covering the bowl. Is this normal? There is no discoloration to the mother at all, only the cloth. Next week should be my first batter bread. How can you tell if the starter is ready for that? Hi Emily and welcome! The stain on your towel is a watermark and nothing to worry about. Changing out the flour sack towel every couple of days, as you are, is the best thing to do about this. I'm happy to hear that your white rice mother is bubbly and has a pleasant sour smell. You asked how you will know whether your mother is ready for batter breads or not. The best gauge is how active your mother seems between feedings, and of course, the smell. If your mother is happily bubbling away and the bubbles seem to be getting larger and more numerous, you're on the right track. Usually by week 3 or 4 your mother has plenty of oomph to raise batter breads. Hello! This is Joan from New Jersey. 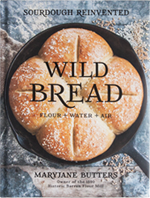 I had pre- ordered your book Wildbread in December of 2017 and received it in the Spring of 2018. It took me a while to get myself and materials together , but I am excited to say I am the proud mother of a sprouted whole red wheat mother . I have to admit I was a bit worried that my mother wouldn�t work , but it did produce bubbles during the first week. I did purchase the proofer as my home is not warm enough for it to sit on the counter. Unfortunately it did not rise on bake day 1 , but I baked it anyway and it was dense and tangy. Week two produced a mother dramatically full of bubbles compared to the week before and my second bake day , the batter successfully rose to the top of the loaf pans! It�s all been very exciting to witness this all happening without commercial yeast. I am now in my third week of feeding mother and she is crazy alive with bubbles , so I will be very excited to try one of the batter breads with fillings later this week. I do have a question , is it ok to increase the 2 teaspoons of honey in your batter bread recipes? If so could you give me some guidance as to how much? The bread is a bit too tangy for my mom and I would like to adjust if possible . Thank you ! Hi Joan. 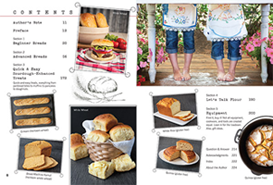 I�m so happy to hear that week two was a success and your breads rose to the top of the pans! I don�t see any reason why you couldn�t increase the amount of honey in the recipe. Depending on how much more honey you add, you may need to add a little extra flour to counter the additional liquid. Since you�ve made the batter bread twice, you�re likely pretty familiar with the consistency and will be able to adjust the amount of flour as needed. I have a hunch that you can add upwards of 1/4 cup of honey without it effecting the amount of flour too much.